This week we saw how amazing the Nokia Lumia 800 Display survives under the sun. (if you missed it, click here. 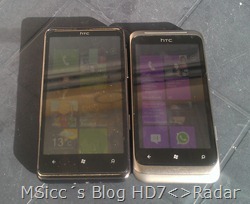 As I don´t have a Nokia Lumia 800 yet, I decided to compare an HD7 with a Radar and a Titan. First I made screenshots from HD7´s and Titan´s start screen to check if there is a difference. I hardly see a difference. So, my second step was to take two different photos on each Device. One from the sun with some veil of clouds in front, and one of a garden. Ok, it is no surprise that the Titan´s picture is the best as it has the best camera of the three devices. The Titan took also the most original colors on both motives. The Radar takes better picture than the HD7, but not as good as the Titan. At least I compared the screen within the sun light. The screen brightness is set to automatic on all devices. As you can see, the Radar display is still readable, while the HD7´s display is near to not visible. The Titan´s display most readable. I used two different angles to see how the HD7´s display will respond to the others, but this makes no difference in reading. So we have a clear winner here: the HTC Titan. The Radar is only little behind, while the HD7 is far from the two Mango phones.